This picture is a complete illusion. When you initially look at it you see half of a mans face looking straight at you. But after you focus on the picture and stare into it, his face shifts and you see him looking at you from his profile (side view). Did you see his face shift? Ha, took me a minute but I got it. Crazy. 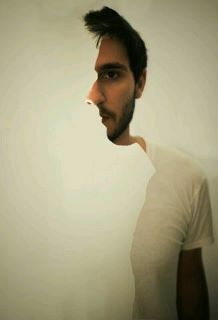 I crack up every time I see this illusion because that guy looks like my brother, lmao! CRAZY! At first I didn't see it but I did after a minute. Our body is capable of some incredible things. Crazy stuff! I love illusions! Ahh am I the only one who can't see it?! Lol. I see him but don't get the shape to the left. Maybe I'm analyzing it that much. wow...i had to look at it a few times but it finally switched! I was expecting something to show up on the left, not for it to change on the right! Whoa, this is creepy fun!